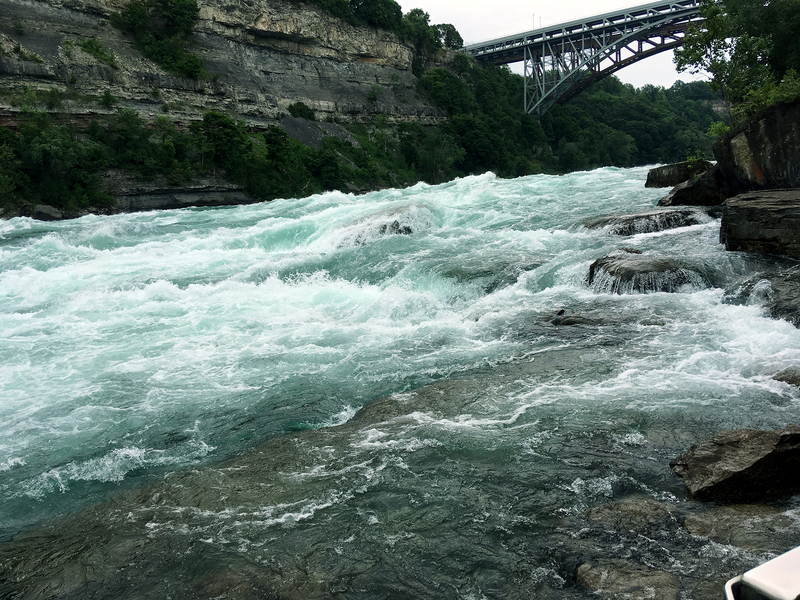 Walking alongside the rapids of Niagara Falls before returning to our former home of Toronto, Ontario. All while squeezing in some TLC time for Clemie amid camping trips in Port Elgin and Kawartha Lakes, Ontario. After border crossing #487354, we were home, sweet home and ready to catch up with friends and family all around southern Ontario (whoever’s keeping the border crossing tally might be a tad hyperbolic). 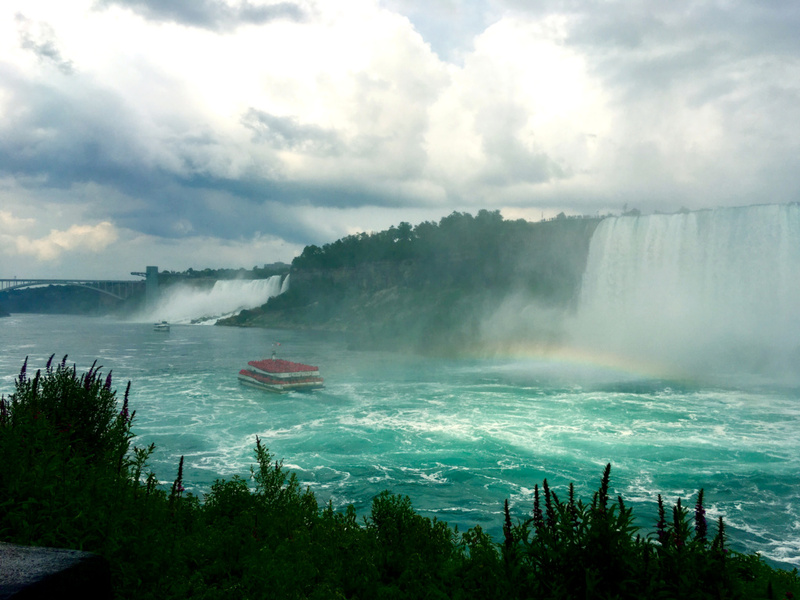 We were stoked to spend some time with friends in Niagara Falls before heading to Toronto and were lucky enough to have a hookup with Niagara Parks for all kinds of complimentary passes to the good, non-cheesy attractions (shoutout to Brandon and Bev 😉). We spent a day being tourists doing the cable car over the whirlpool, walking behind the falls and indulging in some kids entertainment at The Fury. The next day, we did the White Water Walk and got splashed by the most dangerous rapids in the world. That’s right, these are Class 6 rapids and are completely off-limits to rafters or paddlers because they’re that nuts. The limestone in the rocks give the water a beautiful, ultra-saturated teal colour that looks like a sea of cotton candy. 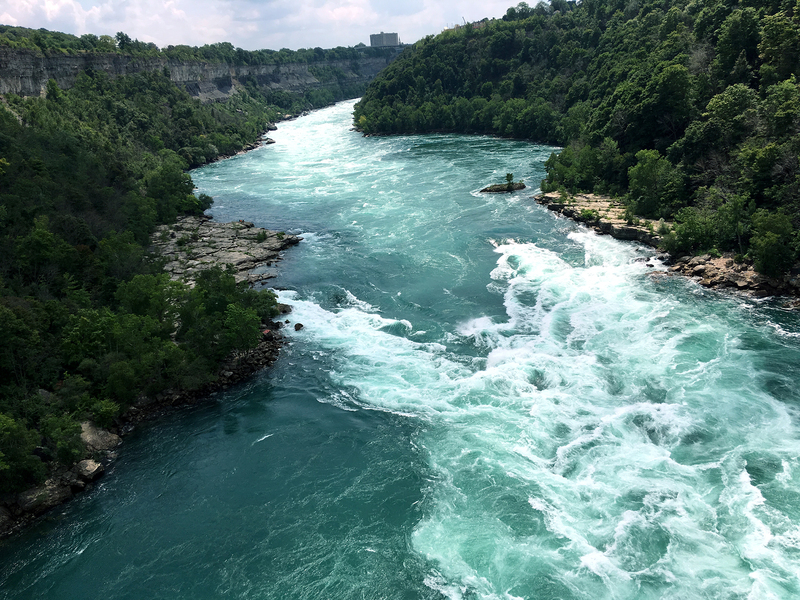 If you find yourself in Niagara Falls, skip the wax museums of Clifton Hill and walk over to the gorge – in my opinion, it’s one of the most beautiful parts of the whole area. We didn’t bother with the Hornblower (the bigger, badder and crazier version of the Maid of the Mist, which is now the New York side’s attraction) because it was hot as hell out, the line was way too long and we had our share of plastic poncho-wearing for the day already. It had been 10 months since we left Toronto to move to Alberta and it felt a little surreal to be back – mainly because we brought our entire house with us. As always, it was great to spend time with friends and family and catch up on some work and van maintenance. We managed to cross quite a bit off of our list including rerouting our sink drainage, making a new table and sealing a couple chips in the windshield. It was nice to be parked at my parents’ house where tools and running water are plentiful. And of course, parents love to feed ya! 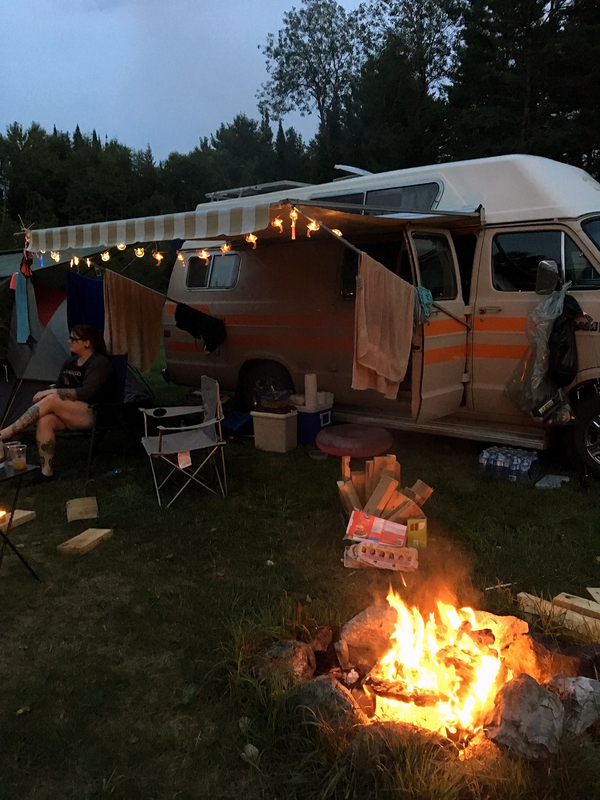 With full bellies, we headed to MacGregor Point, an Ontario Provincial Park on Lake Huron, for a camping trip at our second paid campsite in 6 months. Yup, ever since we installed our solar system, we’ve only paid for two campsites since March. One in Tofino because we pretty much had no choice and this group camping trip that was planned months ago. How many people can say they’ve only paid one hundred and fifty odd bucks in rent in 6 months?? 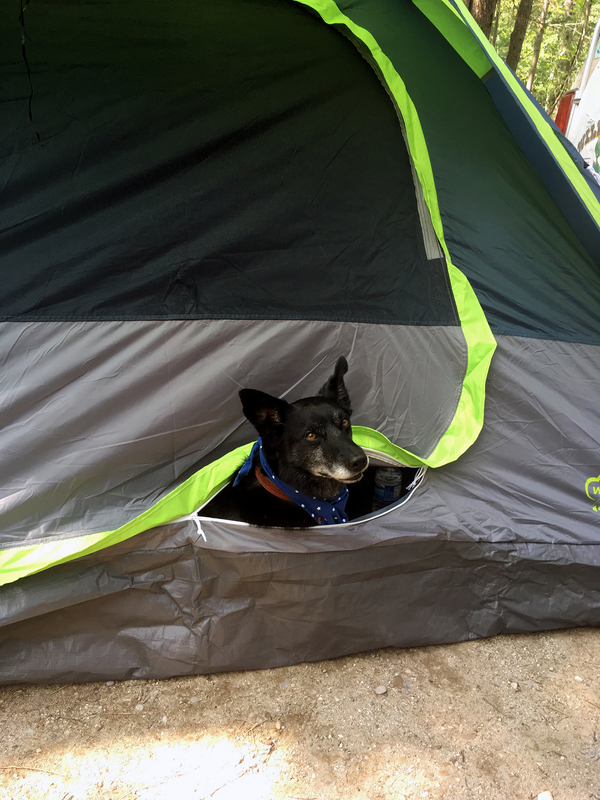 Fees aside, it was a really nice campground that felt like we were alone in the woods, which is generally preferable when camping as opposed to the all too common sardine can campgrounds where kids wake up super early and just scream all day. On our way out, we checked out the beach in Port Elgin where the crystal clear waters of Lake Huron make you feel like you’re somewhere tropical and do such a great job at making you forget just how damn cold it gets in the winter. Not long after we returned to the city to get back to work, we were headed off on another camping trip. This time, we headed east about 2 hours north of Peterborough to do some boondocking on some of Ontario’s mythical Crown Land (public land). If you’ve ever tried to locate Crown Land in Ontario (namely southern), you’ll know exactly what I mean. Sure, the government website provides a map but it’s complicated and not very user-friendly. Truthfully, I think that that’s their intention since it’s unclear whether many of the spots are even accessible – especially with a vehicle. Anyway, deciphering maps and finding camping spots has become a regular part of our daily lives so we were game to give it a whirl. We found an amazing spot called Cashel Lake where a few other campers had already set up shop to enjoy the peaceful woods and pristine lake. 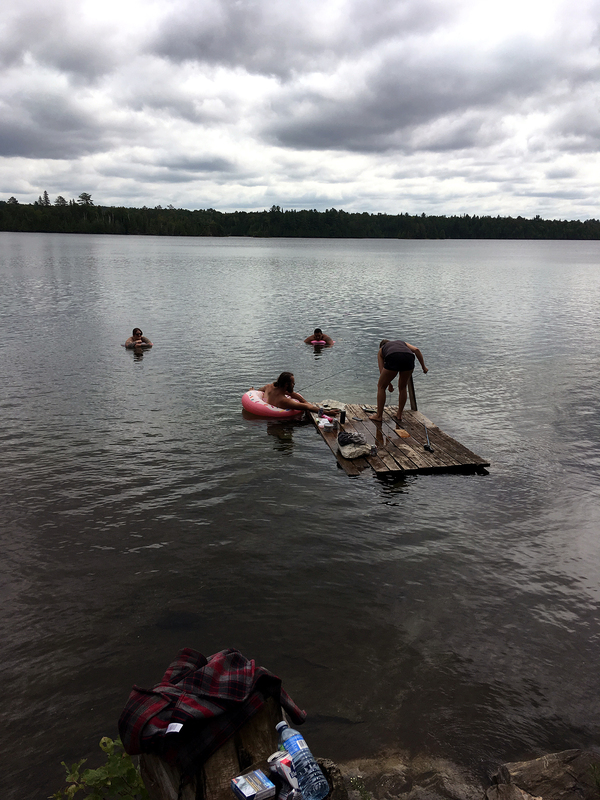 We spent the majority of the weekend floating in the water with friends while soaking in as much of the non-city air as we could before heading back to Toronto. I even dug out my childhood fishing rods that became our new favourite tools and even helped to catch us dinner one night. Not bad for city folk! After returning home and tying up some loose ends with van repairs, we were ready to get back into “routine” and hit the road again. Saying goodbye is always bittersweet but our goodbyes are always more “until next times” than anything else. Leaving the city this time around was so much more relaxed than last time when we were about to fly across the country to move into our house that we hadn’t even seen before. We’re geared up and ready to hit the East Coast and can’t wait to cross some more provinces off our list!